At Bionic we have for years again and again discussed issues around the sustainable use of arable soil in more than one way. After all Bionic Fuel’s microfuel technology produces one of the most effective biochars available (besides the main product: liquid drop-in fuels), while Bionic Palm started more than 5 years ago to actively explore methods of sustainable and organic farming in tropical Africa. 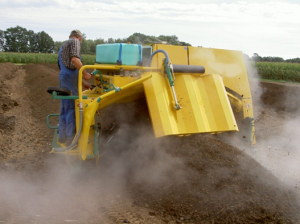 Soil fertility, i.e. the soils natural content of macro and micro nutrients required by practically all plants for a healthy development, is a major feature defining the usability of a stretch of available land. Against that background it doesn’t come as much of a surprise that when the chance came up during 2012 at Bionic Lab in Germany we worked hard to develop a new cooperation implementing a patented bio fertilizer production technology for a 100% organic NPK substitute. Feedstock for the process is a combination of biomass and manure, treated with special fungi and bacteria over a period of 45 days. 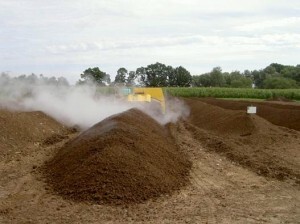 Opposed to common uses of composted biomass and animal manure as fertilizers which are difficult and risky to apply, the Bio-Elite process guarantees a completely normalized macro nutrient content, allowing the application of exact nutrient amounts as required. Typical negative effects of over- or under-fertilization are a thing of the past. For quite some time now experts and researchers agree on the need to better reuse plant nutrients, as synthetic fertilizers are not only getting more and more expensive, they also contribute significantly to climate change and some of the required natural resources are quickly running out. Nature does recycle plant nutrients at an almost 100% rate, but with modern farming and food processing chains most nutrients end up anywhere but where they came from: the farm. It would be necessary to close the loop from waste management and manure treatment plants back to the farm. The key issue, as already mentioned above, is the fact that modern intensive farming requires a relatively precise calculation and application of the key nutrients. Here is exactly the point where Bionic Lab’s new approach comes in: with the Bio-Elite process invented and patent by Bionic’s partner Wolfgang Wondrak (unfortunately the linked website is currently in German only). From 2013 Bionic will actively market the unique Bio-Elite process to its waste processing client base as an exciting addition to the microfuel waste-to-fuel conversion technology. It is important to mention, that from the very beginning this new organic fertilizer is highly competitive against its synthetic rivals in terms of production cost. So this new fertilizer product is fully substitutive, organic, 100% climate neutral (if bio energy is used for the production and logistic processes) and even comes at a lower cost. No wonder, that after only a few months of unofficial marketing the interest from potential clients is already overwhelming. Further information can be found on Bionic World.